Clad in zinc, the house rises from ground level and twists toward the lake. A mortar-free retaining wall made of hand-cut marble frames the driveway. Teeple Architects’ latest residential project in southern Ontario celebrates all that surrounds it: fields, trees and water. A wall of glass separates the outdoor pool from the media room. 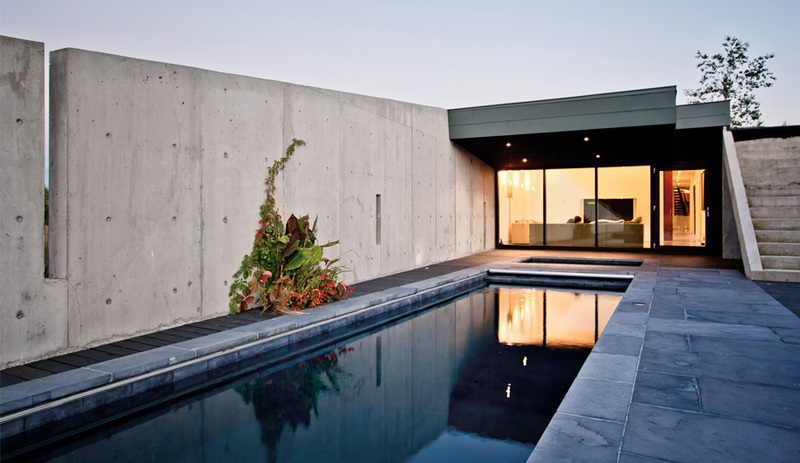 The pool and hot tub are kept warm year round using geo­thermal heating. In late fall, the farmland on the lakefront road into Port Hope, Ontario, is pristine, even idyllic: golden fields rolling toward a shimmering horizon of water, here and there clutches of tall trees, their leaves a brittle yellow or blazing red. As the main road turns into a gravel lane that winds through an open field, there is still little evidence that a newly built house, by Teeple Architects, lies straight ahead. 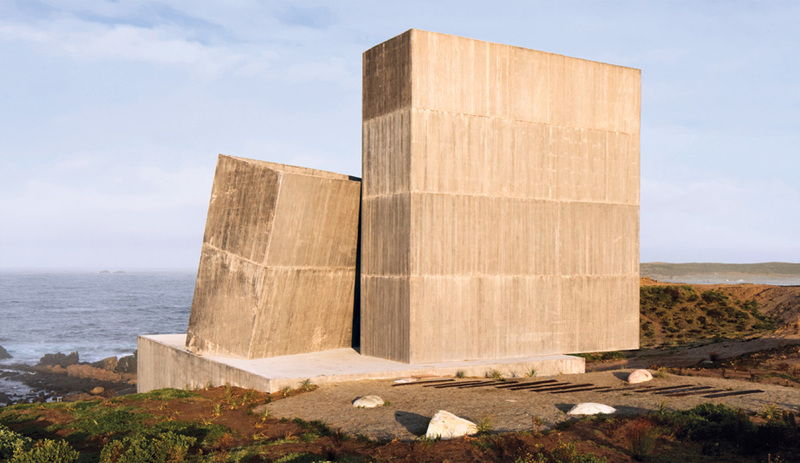 Not, at any rate, until one catches a glimpse of the muted green, zinc-clad structure rising and curving up from the scrub and flaring toward the lake. 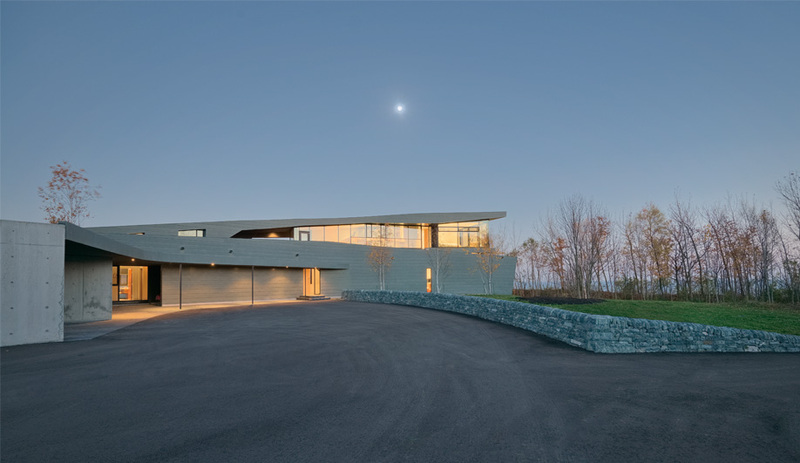 The focal point of the house is the sunken living and dining area, which faces onto the edge of Lake Ontario. Set on 30 hectares, the two-storey dwelling at its highest point overlooks a rocky bluff that drops precipitously to the lake. 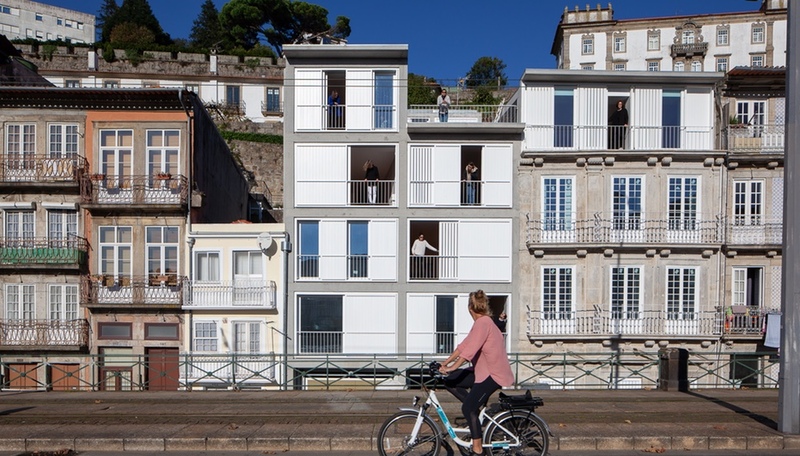 But this unusually narrow, low-lying house really begins sunken in the region’s compact earth at its north end, with a rectangular lap pool and a whirlpool surrounded by a wooden deck and radiant-heated limestone. The pool is kept warm year round because the Danish owner prefers to swim in the dead of winter. 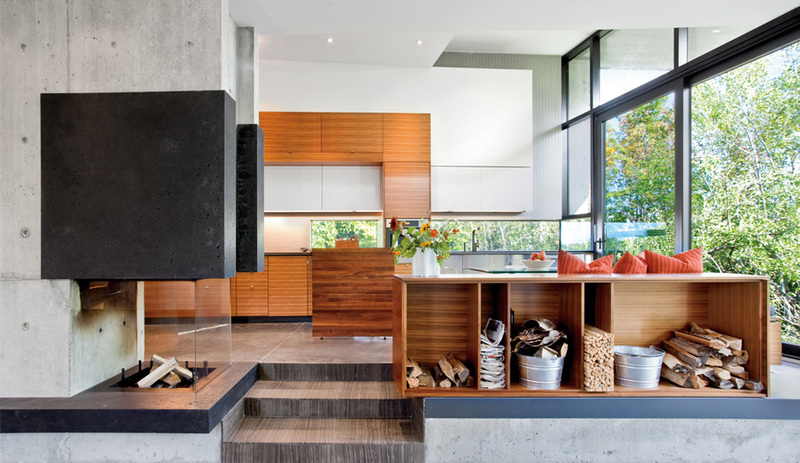 A wood-burning fireplace divides the kitchen and living areas. To the right is a breakfast nook for quick meals. The main entrance is at its midpoint. A media room, a fully equipped sauna, a mud room, and bedrooms for the owners’ two teenage boys are located along a narrow corridor defined by a radiant concrete floor tinted a deep grey. 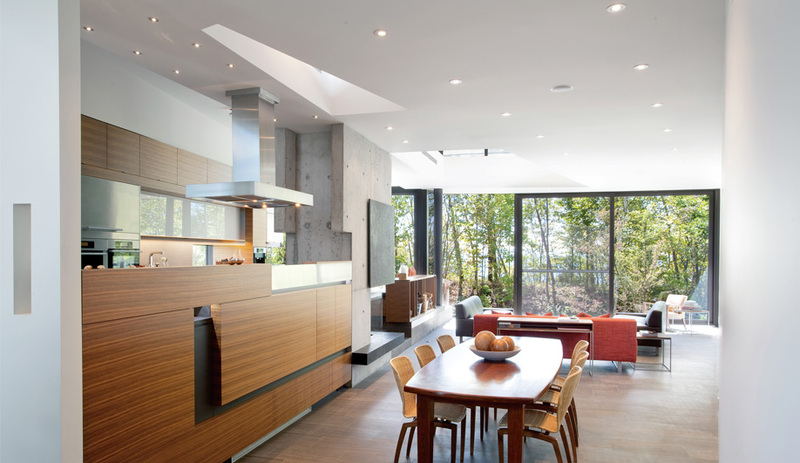 But the house’s real drama reveals itself as the foyer morphs into a sunken dining and living room with vein-cut Eramosa limestone floors that run all the way to a fully glazed wall. Next to the living room is an elevated kitchen and a breakfast nook with warm walnut panelling and raw concrete features. The view, from both the kitchen and living areas, is directly through the trees to the lake, by turns complicated and cinematic. 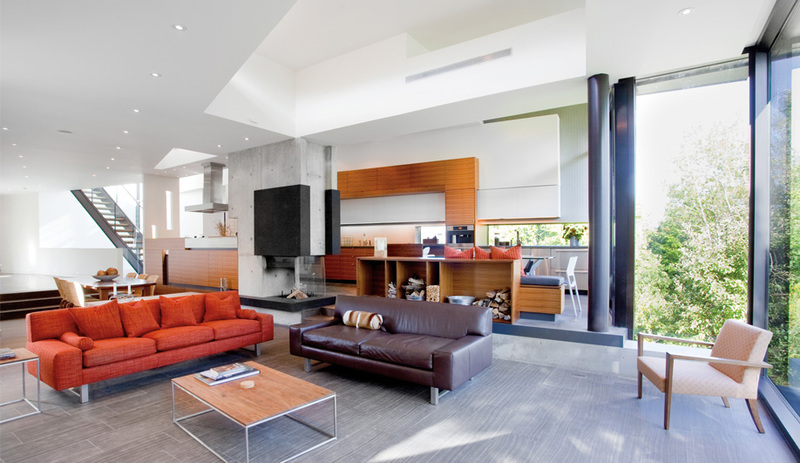 A V‑shaped skylight lets light seep in from above, giving the main floor a full-bodied glow. 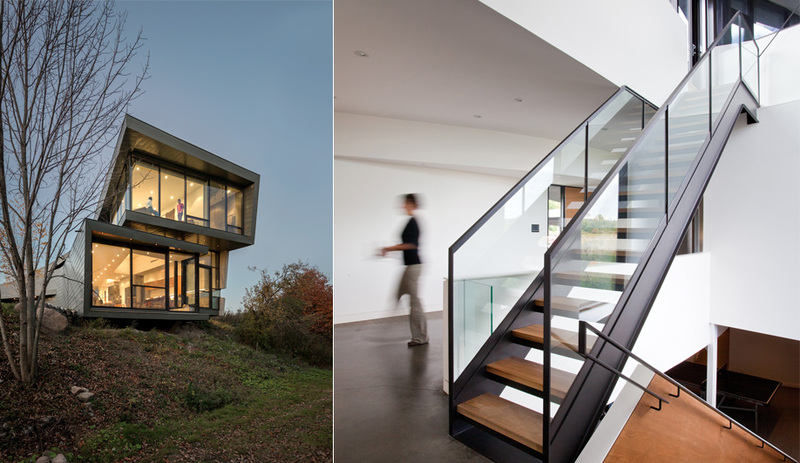 Left: Two long volumes stacked on top of each other, and at different angles, offer views of a wooded trail and the lake. 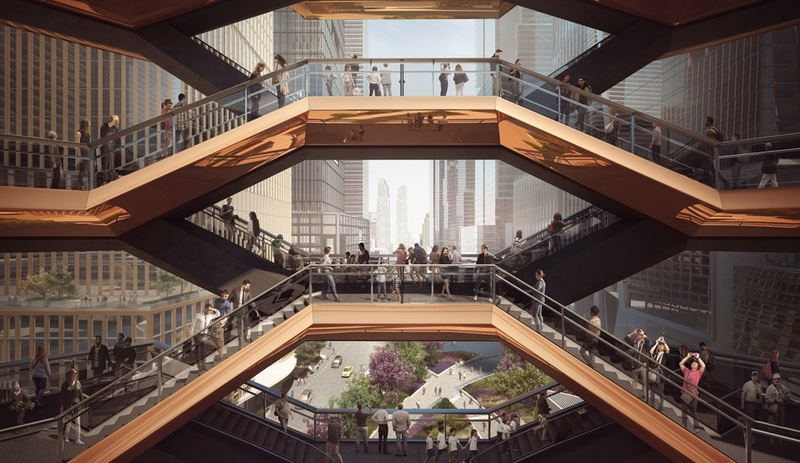 Right: The upper-level deck can be reached from inside via a dedicated stairway. The stairway to the second floor is steep and narrow, the steps clad in the same warm, striated walnut as the kitchen. Tall windows in the stairwell create the sensation of climbing upward directly from the fields. Both the spacious master bedroom and the ensuite bath are framed by full-height, curtain-free windows that are open to the lake; yet these are intimate spaces, private by virtue of the property’s size and the position of the house, that fully embrace the sublimity of the natural world. Behind the bedroom is a small office and an entrance to the deck that leads all the way back to the pool. 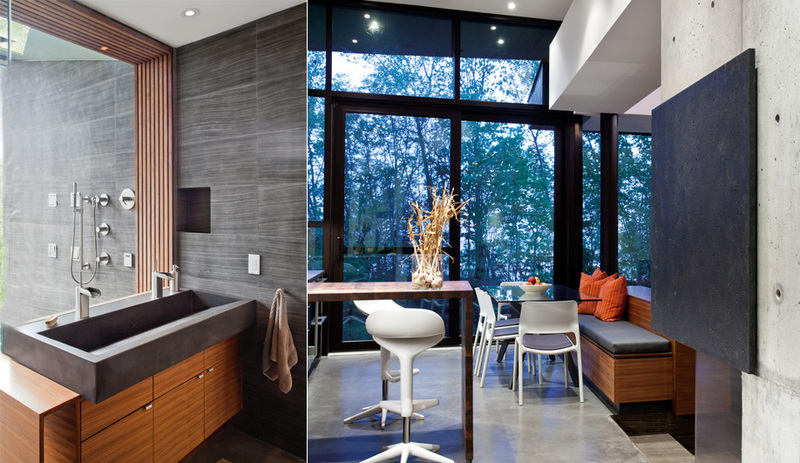 The site's secluded location allowed the architects to build glass walls everywhere without the need for curtains, even in the master bathroom shower (left). 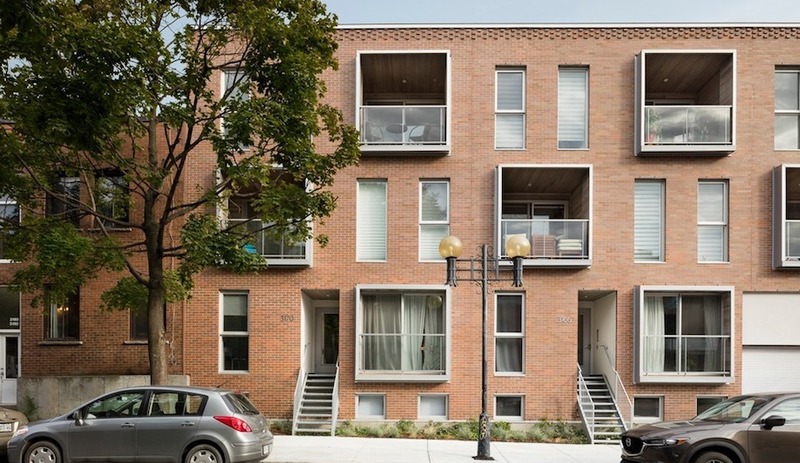 While the house incorporates such energy-efficient elements as rainwater harvesting, geothermal heating, radiant floors, and windows that provide ample opportunities for passive heating and cooling, it makes no attempt to discreetly meld into the surroundings; rather, it provides a dynamic, symbiotic addition to nature. Although expansive in size and form, it also contains small, elegant touches: a retaining wall at the entrance, made from hand-chipped, mortar-free serpentine stone, curves along the driveway; and a young birch, rooted within a small courtyard, is now growing up through the roof. The master bedroom is glazed and surrounded by treetops.